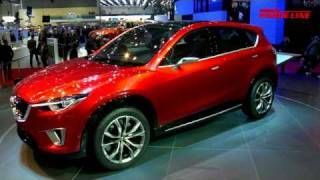 Mazda Minagi Concept made its North American debut at the New York Auto Show 2011. The word Minagi in Japanese translates to "an expression of the buildup of total energy which can burst into motion at any time.". And, the official press release claims the Mazda designers seeked out for a Cheetah to draw the inspiration! By the way, Mazda CX-5 is the production version of this concept which will be available across the globe starting in 2012. 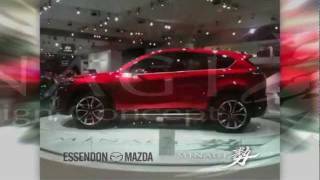 NEW YORK (April 21, 2011) - Making its North American debut at the New York International Auto Show is Mazda's MINAGI Concept, the first model to feature the brand's breakthrough SKYACTIV technologies and KODO design language. 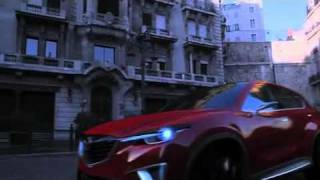 Showcasing a production-ready design, the compact SUV incorporates the full suite of SKYACTIV technologies, including the powertrain, chassis and body design, and is the second concept vehicle, following SHINARI, to emphasize the "KODO - Soul of Motion" design theme. 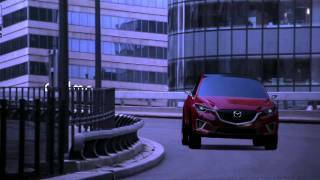 "I felt a compact SUV was the perfect vehicle to express agility and focused movement; the flexibility of four limbs moving in unison, and in an upright posture," said Masashi Nakayama, Chief Designer, MINAGI Concept, Mazda Motor Corporation (MC). While SHINARI was a pure design concept to express the full potential of KODO design, MINAGI gives a not-too-subtle hint of the next generation of Mazda products to come. MINAGI's design elements combine the expression of energy pulsing throughout the vehicle with the keen agility to move about freely and nimbly. With its upright, compact packaging, MINAGI offers a vision of KODO design that is different to SHINARI yet shares the same sinuous, powerful stance. Derived from "minagiru," which means to gather or accumulate, and "ikioi," which means momentum or to catapult forward, MINAGI loosely translates as "an expression of the buildup of total energy which can burst into motion at any time." For MINAGI, Mazda designers looked to the cheetah, the fastest animal on land, to draw inspiration. A cheetah's head is positioned high, while long, powerful and supple limbs hold its lean torso upright to enable it to change direction quickly at high speed. When visualizing how the animal hunts, Mazda designers set out to evoke the moment when the animal contracts its muscles, ready to sprint and lunge at its prey. Furthermore, such a lunge can be in any direction; an idea which fits with the function of an agile compact SUV as it quickly yet gracefully maneuvers through a sprawling cityscape. An emotional design fused with exhilarating performance is the unique combination sought by urban explorers. Not ones to be content with keeping still as the world passes by, they seek to venture out and gain new experiences. With the ability to maintain a smaller carbon footprint than similar-size vehicles, the MINAGI Concept fits perfectly into the in-between. Environmental efficiency is a function of not just Mazda's revolutionary SKYACTIV engines and transmissions, but by also being developed to have a SKYACTIV-Body, which means body rigidity improved by 30 percent over current models while being eight percent lighter, and a SKYACTIV-Chassis, which combines a 14-percent lighter chassis with revised suspension and steering functions. The MINAGI Concept symbolizes the evolution of Mazda and is the forerunner to the launch of the brand's next generation of Zoom-Zoom. The MINAGI Concept is compact if not conventional, muscular but also slender. With well-toned lines, the MINAGI's exterior expresses a sleek silhouette with an emphasis on its rearward stance, like that of a crouching savannah cat. Pushing the A-pillar toward the rear focuses on the driving position. This is in sharp contrast to the single-arc profile of the frontward A-pillar placement found on minivans and the cabin's position relative to the lower body is further back than as seen on conventional SUVs. Sharing its front fascia with SHINARI, the chromed "signature wing" makes MINAGI immediately recognizable as a Mazda and creates a strong, attractive impression. Angling the front grille slightly downwards while juxtaposing the headlamp housings' design to slant upwards creates added intensity, like that of a wild animal's gaze. The design of the three-dimensional headlamp and rear combination lamps add a heightened sense of depth. Sculpted lines along the sides of MINAGI's body accentuate a sense of vigor, which suggest the agile strength of a feline. These contours extend and connect with the rear fender in an elegant expression, similar to the athleticism of a cheetah, from its shoulders and hips to its legs. The prominent front fenders receive even more dynamic contours as do the rear fenders to emphasize MINAGI's strong stance atop 20-inch aluminum alloy wheels. Contrasting styles of the rear fender and taut rear lines liken the vehicle to resembling the strong, seductive hipline of toned athlete. The character lines that flow along the lower part of MINAGI's side panels symbolizes KODO's sense of accumulated power and the overall effect is a graceful and beautiful form, so fluid as to direct one's eyes uninterrupted from front to rear. To create an interior that captures MINAGI's captivating exterior, a driver-focused cockpit and cabin environment were focused upon, expressing a reassuringly high level of strength and solidity by employing quality materials along with the superior fit and finish of detailed hand craftsmanship. A deep, black interior is highlighted by red accents in the rear seatbacks as well as on the door armrests. Four satin chrome struts support the instrument panel, each rising upward in an image of vertical strength. The design of the instrument cluster itself as well as surrounding switches emphasizes the snug yet elegant nature of the driver-focused interior cabin while expressing Mazda's sporty ethos. Luxurious leather is fitted onto the seats and door trims and feature carefully sewn striking raised pleats, a touch that conveys the highest level of quality. The "black-smoked" coating on the dark-tinted horizontal panel positioned in the center of the instrument panel further exudes an affluent atmosphere that surrounds the vehicles' occupants. Also, solid metal components, including the door handles, are milled from solid aluminum and carefully polished to provide a smooth, quality-enhanced surface. The sturdiness of the door handles resemble the beauty and functionality of high-end racing bicycle components, further adding to the MINAGI's elegantly athletic feel.